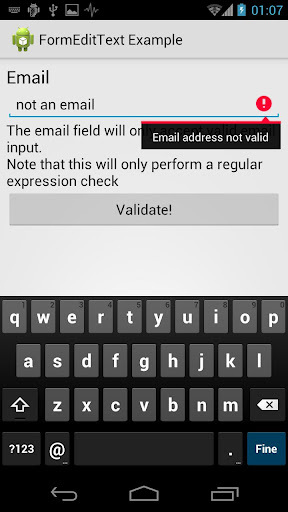 Input validation could be very painful. Building forms, in every technology, is a boring and painful job. Bored about giving birth another painful form I decided to write an opensource library that does almost everything for me. The library is called FormEditText and you’ll be able to browse/download the sourcecode here in github. The basic usage of the library will allow the developer to get an edit text validated through xml attributes. line #10: we provide a value for the stock android:inputType attribute. the input is not valid: in this case the library will return false and will set an error message that will look like the image on the top of the page. When in the first case the library won’t do anything except returing “true” on line #3 of the previous snippet. I’ll suggest to take a look at the github project. If you want to try the library I also setted up an example app that you can download from the market.